Abraham Lincoln said, "The best way to get a bad law repealed is to enforce it strictly." At the bridge table, if you can afford to worry about a bad suit break, do so. Occasionally, it will not matter, but when the suit is unfavorable, you will be happy that you took precautions. This deal provides an example. 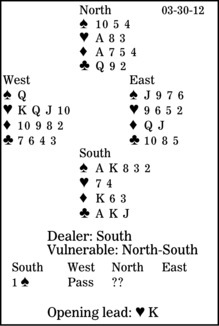 How should South play in four spades after West leads the heart king? As a secondary matter, what should North respond when his partner opens one spade? Taking the bidding question first, North should raise to two spades. Despite 10 points and two aces, that hand has nine-plus losers (the normal number for a single raise). The 4-3-3-3 distribution is another minus. But South bids four spades anyway. With two unavoidable red-suit losers, declarer can afford only one trump loser. What is the correct play in the suit? He should start with his ace. When West plays the queen, South must not be tempted to cash the king, trying for an overtrick. He should continue with a low spade to dummy's 10. In a moment, when back in the dummy, declarer leads the remaining spade, finesses his eight, draws East's last trump and claims. Interestingly, if the spade ace collects only low trumps from each opponent, it is again right to lead low toward the 10 on the second round. As Alexander Pope nearly wrote, "A little learning is a dang'rous thing. Play deep, or taste not the Pierian spring: There shallow draughts intoxicate the brain, And bridge games largely sober us again." Don't overlook a safety-play that will clear your contract.